Beaches, jungles, marine animals and shipwrecks make this western Pacific Ocean island a must-see destination. With scuba diving sites, brightly colored corals, lagoons, caves and mountains, Saipan offers a rich outdoor lifestyle. Dive to see tropical fish, hike through acres of jungle or simply relax on the beaches. Saipan is the largest of the Northern Mariana Islands. The western Pacific Ocean archipelago is part of the United States Commonwealth and lies south of Japan and east of the Philippines. Garapan is the island’s largest town, the hub of Saipan’s tourist industry with hotels, restaurants, shopping centers and stores. Pick up maps and tourist information and get your bearings. Most visitors come to Saipan for its beaches, particularly those on the island’s western side. An offshore coral reef has created a large lagoon with numerous sandy coves. Micro Beach is one of the most visited. Steady winds and calm waves attract windsurfers; plan to give this sport a try. Treat yourself to a picnic or barbecue using the beach’s pavilions. Divers love Saipan. The island’s handful of scuba diving operators serve all experience levels. Explore the rich marine flora, reefs and shipwrecks. Go to the Blue Grotto, a large underwater limestone cavern on the island’s northern side. This dive site is worth a visit even for non-divers, just to see the dark blue water and rock formations. Swim or snorkel if you aren’t diving. Saipan was the location of a fierce and decisive battle between U.S. forces and Japanese soldiers during World War II. Visit the Last Command Post and see the bunker and its cannons. Look for tanks half-way submerged in the sea. To explore some of the island’s jungle, take the Laderan Tangke Trail, a 2-mile (3.2-kilometer) loop through the Marpi Commonwealth Forest. Along the way you may see such birds as rufous fantails and nightingale reed warblers. 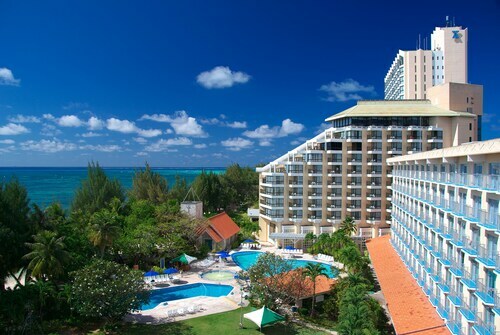 Most of Saipan’s resorts and hotels provide tours to various sites. You can also reach the island’s beaches, jungle and historic sites by renting a car or scooter or taking a taxi. Embrace everything there is to see and do and head home with the greatest souvenir of all — memories of your amazing trip! If you'd like to check out the full range of activities, jump onto our Saipan things to do page. 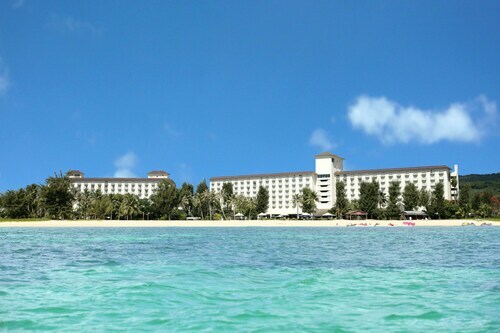 Nestled on the beach, this Saipan resort is 0.7 mi (1.1 km) from F.M. Palacios Field and 1.9 mi (3 km) from Saipan Country Club. Managaha Island and Micro Beach are also within 6 mi (10 km). 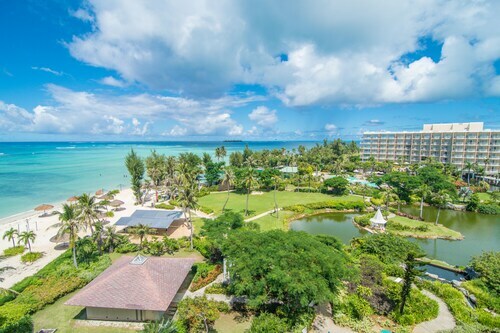 Nestled on the beach, this Saipan resort is 0.1 mi (0.2 km) from American Memorial Park and 1.7 mi (2.7 km) from Managaha Island. Micro Beach and Paseo de Marianas are also within 10 minutes. 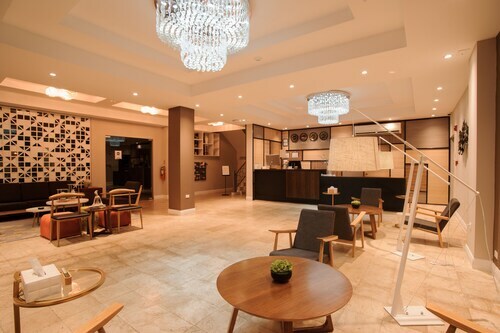 Situated in Saipan, this hotel is 0.3 mi (0.4 km) from Paseo de Marianas and 1.8 mi (2.9 km) from Managaha Island. Micro Beach and American Memorial Park are also within 10 minutes. 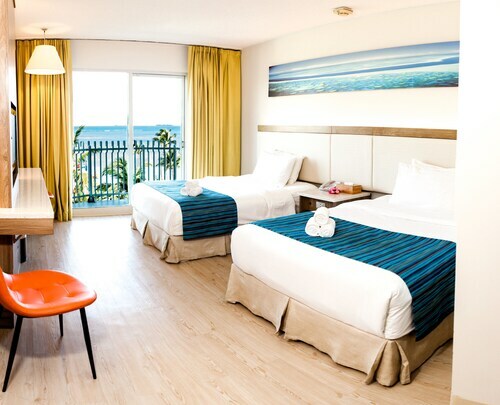 Nestled on the beach, this Saipan hotel is 2 mi (3.2 km) from Saipan Zoo and 2.4 mi (3.8 km) from Marianas Country Club. Managaha Island and Managaha Beach are also within 6 mi (10 km). The Fiesta Resort and Spa Saipan is steps from the beach in Garapan, a 20-minute drive from Saipan International Airport. It’s a 5-minute walk to the American Memorial Park, and 10 minutes to duty-free shopping and designer boutiques at DFS Galleria Saipan. 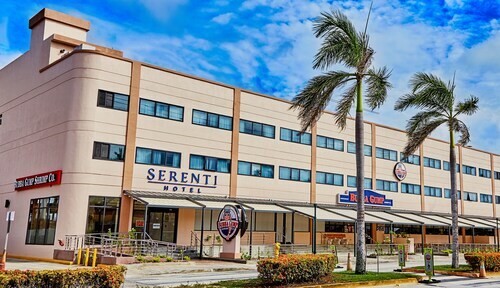 Situated in Saipan, this hotel is 0.6 mi (0.9 km) from American Memorial Park and 1.3 mi (2.2 km) from Managaha Island. Paseo de Marianas and Micro Beach are also within 15 minutes. 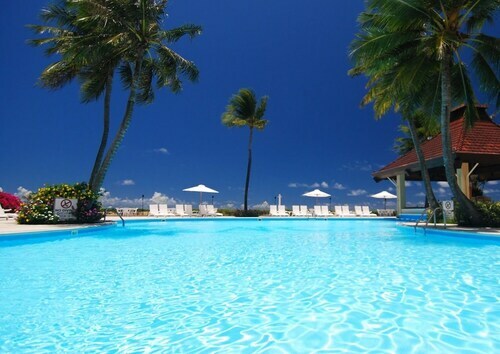 Situated near the beach, this resort is 0.4 mi (0.6 km) from Paseo de Marianas and 1.7 mi (2.7 km) from Managaha Island. American Memorial Park and Micro Beach are also within 15 minutes. 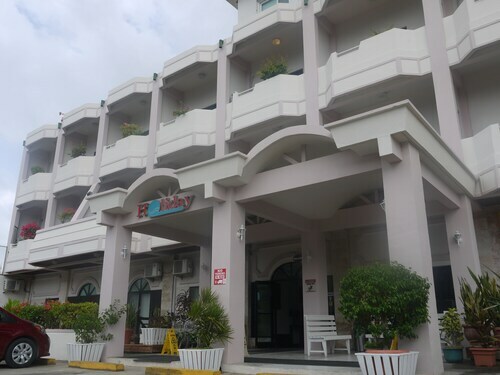 Nestled on the beach, this Saipan hotel is 0.4 mi (0.7 km) from Paseo de Marianas and 1.9 mi (3.1 km) from Managaha Island. Micro Beach and American Memorial Park are also within 15 minutes.